to learn about Thomas Paquette's epic three year journey and this major exhibition of his work. In celebration of our upcoming watercolor painting workshop to Tuscany in June, we decided to share with you some of the interesting and beautiful places we are planning to visit and paint! Our artist's tour of Provence continues in Part IV. We visit Avignon, Chateauneuf-du-Pape and Carcassonne. Travel painting at its best! The artists who founded the first major Canadian national art movement painting on location in some of the wildest areas of the great North - the Group of Seven. Our Artist's Tour of Provence continues in Part III. We visit Arles, Les Baux, Avignon, Chateauneuf du Pape and Carcassonne. Travel painting at its best! the most beautiful villages in Provence. If You Can't Stand the Heat - Paint in Petoskey! landscapes and water of Northern Michigan. An inspirational gallery of more than 50 wonderful garden paintings from artists old and new. The lesser-known Australian Impressionist painters were pioneers in portraying the unique light, landscape and daily life of Australia. painting the Mississippi from 300 feet in the air. Enjoy this slide show from our plein air oil painting workshop in Abiquiu, New Mexico, featuring painting locations at Ghost Ranch, Echo Amphitheater, Abiquiu Lake and on the Rio Chama. Join us as we spend a week painting, teaching and exploring the wonderful mountain scenery that surrounds the cowboy town of Dubois, Wyoming. Pack your bags - Abiquiu and Ghost Ranch, New Mexico, are a dream come true for the plein air painter. Take this illustrated tour through the magnificent rolling grasslands of the Flint Hills of Kansas and you'll discover what has caused all the excitement among landscape painters. Free. 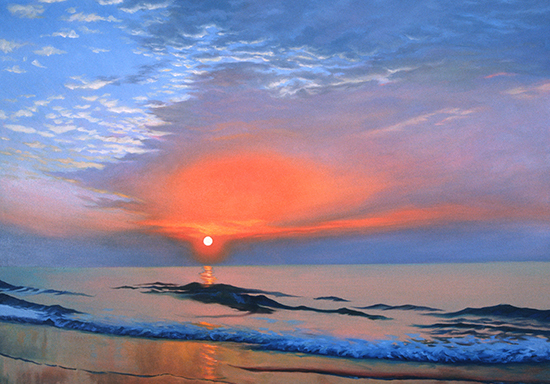 We hope that this gallery of paintings in oil, watercolor and pastel will inspire you as well. Take a painting trip to beautiful Charleston, South Carolina, and explore its diverse painting opportunities, art galleries and southern charm. Exclusive only on The Artist's Road - our personal favorite easy-to-access painting sites in Rocky Mountain National Park in Colorado. An illustrated tour. Exclusive only on The Artist's Road - our personal favorite painting sites in the Hudson River Highlands of New York State. An illustrated tour. Here is a sampling of some of our favorite books on artists' gardens. John explores Montalcino, Pienza and the Sienese Crete in search of inspiration and interesting characters. Free. Enjoy this example of the type of in-depth articles available to members. An artist residency in Glacier National Park takes a tragic turn as the artists make their way up to a back-country chalet. The artists travel to northern New Mexico in search of painting gold and find it along the Rio Grande. Knowing what not to take is just as important as knowing what to take when you travel overseas to paint. This valuable checklist makes it simple. Enjoy this mini Tale from the Artist's Road in Rocky Mountain National Park, in which John and Ann share their recent painting adventures during John's artist's residency there. Enjoy this short Tale from the Artist's Road of travel adventure in Tuscany. Included in this article are some of John's hand-written field notes which reveal his methods for overcoming the many challenges Nature throws in front of the plein air painter while working outdoors in the Low Country of South Carolina. (Previously published in Watercolor Magazine and reprinted here with permission). 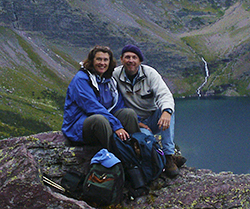 John and Ann share their recent painting adventures in Rocky Mountain National Park, where they spent two weeks exploring, hiking and painting during John's artist residency there.